C'mon, you have to admit it: modern fighter planes asses really turn you on. 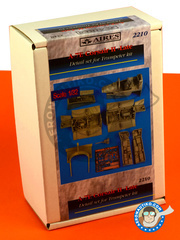 The guys at Aires know that very well, and do what we were all waiting for: the exhaust nozzles for the asses of the F/A-18, MiG-23, F-14 Tomcat, and the A-7 Corsair. 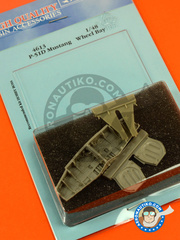 And although they're not for the rear side, equally interesting are the detail up sets for both Phantom and Mustang landing gear bays and interiors, all in 1/48 scale. Montex Mask bring us a trio of references for three different planes, all with beautiful asses too: the round one on the Il-2, two versions for the pert one on the Spitfire, and two more version for the playful one on the Stuka. From time to time we get some really incredible products, and this set by Aires is definitely one of them. The detail level accomplished is unbelievable, mainly in the wheel bay piping. A true mind-blowing product!! 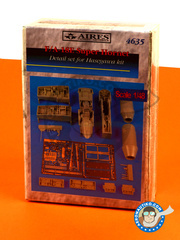 Don't hesitate in using this Aires upgrade, and replace the plastic parts of Hobby Boss kit with these wonderful resin parts including all rivets, pipping and hidraulics. The landing wheel bay is one part, and the bay doors come in the other. 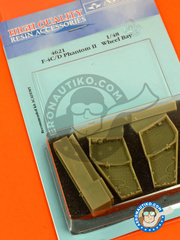 Go one step further building your Phantom by replacing the plastic parts of the kit with these three resin parts: as you can see in the pictures, they feaure all rivets, hidraulic tubes, electrical pipping, controllers, electronics, … for all three landing wheel bays. Package includes a full set of parts for revamping the whole cockpit: seats, dashboard, control sticks, avionics, seatbelts, … all of it by using a photoetch sheet, a printed acetate for the dials, and a good pile of included resin parts. 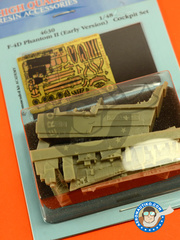 This set includes parts for revamping the whole cockpit of the early version of the Phantom D. In the package, you'll find seats, dashboard, control sticks, avionics, seatbelts, … all of them made on resin and photoetches. 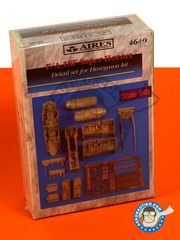 Package includes both exhaust nozzles of the Hornet in open position, made in high precision resin, for replacing the plastic parts in your Hasegawa kit. 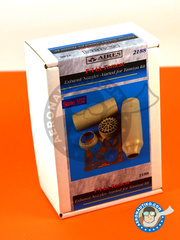 Now you can improve the exhaust nozzles of Revell Hornet in 1/48 scale with this set by Aires. The blister includes the full parts break up as shown in the pictures, made in first quality resin and the mind-blowing detail level usual in the brand. 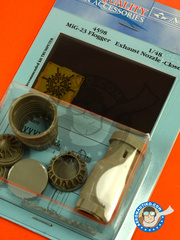 Package includes the exhaust nozzle in closed position, made in resin, and a high precision photoetch to replace the plastic parts on the Trumpeter kits. 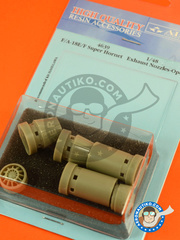 Previously we introduced you the exhaust nozzle in closed position by Aires, and now is the turn for the open exhaust nozzle for detailing the Tamiya kit. Inside the box you'll find the resin parts and photoetch forming this set. 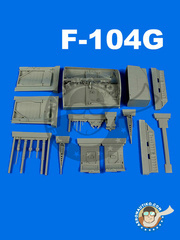 Here's a new detail up set including exhaust nozzles, all avionics, cockpit and landing gear bays for the F18 version E model kit by Hasegawa in 1/48 scale. 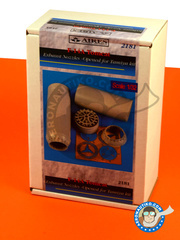 Package includes the full parts break up as shown in the pictures, made in top quality resin and with the mind blowing detailing now usual at Aires parts. 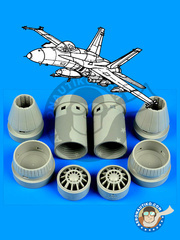 Now you can enhance the exhaust nozzles, all avionics, cockpit and landing gear bays of your F18 scale kit by Hasegawa in 1/48 scale with this Aires set. Package includes the full parts break up as shown in the pictures, made in top quality resin and with the mind blowing detailing now usual at Aires parts. 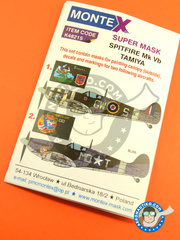 A new product by Montex Mask with two decorations for the Spitfire: the first one belonging to the unit that flew with RAF markings, and the second one with USAF markings, both in August 1942. 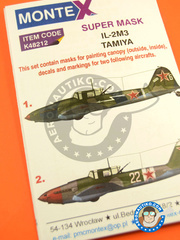 The set includes masks for both canopy and markings, in this case matching one unit of the Ukraine front piloted by Georgiy Beregowoy in April 1945, and to another unit with unknown history. 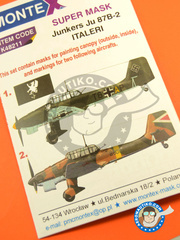 Masks and decals set for building two different versions of the Stuka: one belonging to the unit flying with the Svastika over French skies in June 1940, and the other belonging to the Hungarian Air Force. 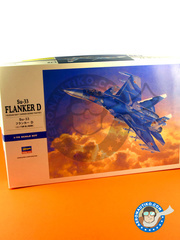 The impressive Su-33 reproduced in an awesome kit in 1/72 scale by Hasegawa, with an extensive parts break up. In particular, the break up and execution of the transparent parts really caught our attention. The decoration included in the box belong to four of the embarked units at the Admiral Nelson aircraft carrier. Inside the Aires box you'll find the whole plane cockpit, bays, front and rear landing gear, and all avionics. And using the included photoetch you can assembly pilot safety belts and all fully detailed dials. Bring your Corsair to life!! An awesome exhaust nozzle in open position by Aires, for detailing the Tamiya kit. 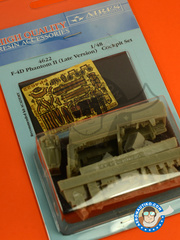 Inside the gorgeous box you'll find the resin parts and the photoetch forming this detail up set.